CEO Mark Zuckerberg will testify to U.S. Congress next week. Facebook announced changes to the way it manages political ads and pages Friday in an effort to "increase transparency and accountability, as well as prevent election interference." "With important elections coming up in the U.S., Mexico, Brazil, India, Pakistan and more countries in the next year, one of my top priorities for 2018 is making sure we support positive discourse and prevent interference in these elections," CEO Mark Zuckerberg wrote on his Facebook wall Friday. As of today, anyone who wants to run "issue ads" around political topics being debated in the country will have to be authorized by Facebook, which is a policy the company put in place for electoral ads last fall. Facebook is working with third parties to develop a list of political issues, which will be revised over time. Later this spring, these ads will also be labeled on the top left corner as a "political ad" and will include "paid for by" information. "We believe that when you visit a page or see an ad on Facebook it should be clear who it's coming from. We also think it's important for people to be able to see the other ads a page is running, even if they're not directed at you," according to a post from Facebook VP of Ads Rob Goldman and VP of Local & Pages Alex Himel. Facebook is investing in A.I. to help mine out advertisers who are skirting by on this issue, but it realizes "we won't catch every ad that should be labeled, and we encourage anyone who sees an unlabeled political ad to report it," according to Goldman and Himel. In June, Facebook will also launch a feature called "view ads" globally, which allows users to see the ads a page is running, even if it’s not in their news feed. The feature is for all advertiser pages, not just those with political ads. 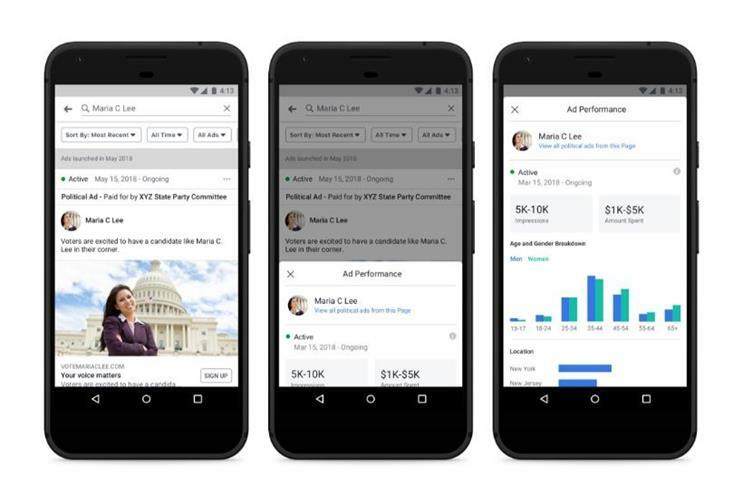 At the same time, Facebook will release an archive of political ads in which all users can search. Information per ad will include the image, text, amount spend, demographic data and more. Additionally, Facebook is looking to cut down on fake accounts by making all pages with large numbers of followers become verified. If the page doesn’t clear Facebook’s process, then the administrator will no longer be able to post on the page. "We know we were slow to pick-up foreign interference in the 2016 US elections. Today's updates are designed to prevent future abuse in elections - and to help ensure you have the information that you need to assess political and issue ads, as well as content on pages," Goldman and Himel stated. "By increasing transparency around ads and pages on Facebook, we can increase accountability for advertisers - improving our service for everyone." The updates comes two days after Zuckerberg admitted that he "made a mistake by dismissing fake news as having an impact" and less than a week before he testifies in front of U.S. Congress on data and privacy issues.